The recent wave of youth protest in Hong Kong was begun by students organised by the Hong Kong Federation of Students and Scholarism on September 14, when hundreds of them occupied the roadways of several major arteries in the city, particularly its business district. The protests were over the change in rules imposed by the Standing Committee of the National People’s Congress (NPCSC), mainly in restricting “civic” nominations in the electoral process for 2017. In fact, the post of Chief Executive, the issue in contention, has been appointed by Beijing since Britain handed the territory back in 1997 under the so-called “one country, two systems” idea. The change in the rules coming from Beijing aims to strengthen the role of the business community in the electoral process, thus reflecting and responding to the need of the Chinese ruling class to consolidate its already tight grip on Hong Kong politics. After some hundreds of protesters were initially and violently cleared from the streets, “Occupy Central” (“Occupy Central with Love and Peace”), an organisation initiated by a law professor at the University of Hong Kong, demanded that the PRC (the People’s Republic of China) government listen to them and began a campaign of civil disobedience with the aim of securing a voting system that provides a process that “satisfies the international standards in relation to universal suffrage”. Democratic and pacifist ideas have dominated the left in Hong Kong since the Tiananmen Square massacre in Beijing in 1989. The “Occupy Central” demand is doubly absurd because the state in every democratic country in the world today vets its own electoral candidates in one way or another and the origins of this demand lie with a particular legal faction of the island’s bourgeoisie. The Chinese Communist Party (CCP) here is simply continuing the strategy used by British imperialism when it ruled the colony both at the level of legal chicanery and at the level of violent repression in order to reinforce its rule. Following the repression of the students by police and organised thugs, government ultimatums, talking of “outside interference” and threatening bloody reprisals, came and went. What repression there was only served to bring more protesters onto the streets, resulting in a wider occupation of central points. A feature of the now dwindling protest movement has been its pacifism, its “politeness”, holding up arms as if in surrender, etc. This was especially noticeable in the business district of Admiralty and the super-expensive shopping district of Causeway Bay targeted by the protesters. By contrast, in the urban and working class district of Mong-Kok, fighting against the police has been ongoing and has only died down in the last few days. At the time of writing the government has had talks with the protest leaders and, given the demand for “universal suffrage”, appear to have things more or less under control for the moment, thus avoiding a more bloody repression for which the protesters were ill-prepared. The trade unions in Hong Kong, again built up by the British, have also joined the call for the “defence of democracy” alongside the protesters’ denunciation of the Hong Kong electoral process as “pseudo-democracy”. But again, all electoral and democratic processes from Europe to the Americas, from Africa to Afghanistan are “pseudo-democratic”, frauds and shams that keep the ruling class intact and the working class oppressed and divided. Another legacy of British rule is the division imposed by immigration and ghettos for the poor Mandarin-speaking workers with an estimated 50,000 of them living in little more than cages. 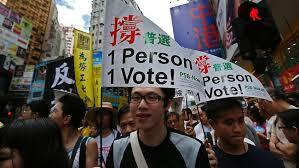 There’s no concern for these workers in Occupy Central’s demand for “universal suffrage”. On the libcom website there are three texts coming from Hong Kong: the first is called “Never Retreat, a Mong-Kok State of Mind” signed by Kristine Kwok and another from Mong-Kok called “Hotpot, Gods and ‘Leftist Pricks’: Political Tensions in the Mong-Kok Occupation” signed by a Holok Chen. The third text is “Black vs Yellow: Class Antagonisms and Hong Kong’s Umbrella Movement” signed by “an American ultra and some friends”. We can look at the third in more detail but first the two based in Mong-Kok: the two texts seem to be from a related unidentified group. They see themselves as “anarchist” – though terms like “anarchist”, “leftist”, “left communist” are impossible to understand here. These anarchist elements were involved in fights with the police, the organised thugs and some local people that didn’t agree with them. They insist on a carnival-type atmosphere to their occupation, including hot-pot, ping-pong and other games trying to construct their own “eco-system” in the area. They are not affiliated to “Occupy Central” and pose themselves as an opposition to it. They appear to see the need for discussion and assemblies but make no bones about the prime aim being “universal suffrage” (which doesn’t include immigrants incidentally) and for every group to maintain activity in their own area. They seem extremely limited and make no mention of the working class. The “Black vs Yellow...” text is something else and it’s not clear if it is in any way related to the previous group(s). Again some of terminology around the role of the “left” is difficult to understand, but there is much more weight and thought behind this long text which we will try to précis. The text clearly opposes the demand from the HKFS for democracy and universal suffrage and the author asks: what if such demands were met? The response is that it would mean participating in your own exploitation while giving rise to new bourgeois forces. The text criticises the group “Left21”, which expresses a commitment to the struggle for universal suffrage” and the establishment of a “participatory democracy” decided by the “people”. The participation in the democratic process is seen by “Left21” as a stage, a stepping-stone to the future where democratic reform can be superseded. We are familiar with these arguments about the justification of the democratic process as a means to a brighter future and it’s just as empty and dangerous in Hong Kong as it is in Britain and elsewhere. And the be-all and end-all of universal suffrage and democracy was also used against in the Indignados protest movement in Spain, in particular via the “Democracia Real Ya” (DRY), the main force for the democratic counter-offensive of the bourgeoisie. Indeed this text points to the realities of the democracies of Greece and the United States as an answer to those that demand it here. Another thing that the author is clear on is the economic basis for the protests. The Hong Kong economy, with the busiest port in the world, became a key re-export and service centre, developing its economy during the 80’s. This was beneficial to both China and Britain until the colony was handed back to China in 1997. Many of the mainland Chinese factories were set up with capital from Hong Kong, Singapore and Taiwan. But underlining the student unrest today are questions of inflation, sky-high rents (an average of 40% of wages), food prices, inequality and public transport. And on top of this the relatively “better off” Hong Kong youth suffer desperate competition for university degrees for jobs that will not exist, or increasingly long hours for young workers or graduates – those lucky enough to be on the exhausting treadmill. The original protest movement of 2014, which also has the background of the “approaching doom” of China, has been re-branded in the west as a pacifist movement limited to constitutional alterations. But it was begun by the Occupy movement in 2011 which, though small and chaotic, made some criticisms of the demand for democracy, and many elements from this milieu were behind the beginnings of the current protest. The original Occupy movement was cleared out by the end of 2012; and in March 2013 one of the largest and longest strikes for decades broke out at the Kwai Tsing Container Terminal. The author says, and there’s no reason to doubt it, that the student and worker protest, if not allied, “was generated by the same economic stagnation and intensifying class antagonism”. Prior to this the text details the riots in the mid-50’s, and riots in 1967 that lasted for eighteen months and were “the largest domestic disturbances in the city-state’s history”. There were massive strikes and street fighting against the police; government buildings and media outlets were bombed and attacked and while we can say that some of this was stirred up by the mainland bourgeoisie which supported the riots against the “fascists”, there are also elements of class struggle. Around the same time the Portuguese army had intervened against the demands of the Chinese-backed protesters in its colony of Macau and then agreed to most of their demands as the colony fell under the de facto control of the mainland. The proletarian aspect to the 67/8 uprising in Hong Kong can be seen in the bourgeoisie’s response: post-68, after thousands of arrests and deportations, the British authorities responded with their post world war one and two “reform” programmes of building more affordable houses, increased wages and an expanded welfare system. There is little such room for manoeuvre today and the author emphasises the “no future” that capitalism holds for youth, the trap of democracy and nationalism and the need for the struggle to spread. There are some ambiguities and the author specifically doesn’t mention the need for assemblies but is relatively clear that the only effective struggle must both involve and be towards the working class. It is clear from the text that the only propensity for a real development of the struggle lies with the working class and first of all its spread to workers on the mainland. And it’s a fact that the majority of strikes have taken place in the Guangdong southern province adjacent to Hong Kong (though it’s also a fact that workers’ strikes on the mainland have spread to all workers and all industries to the interior). The text also makes references to the history of wildcat strikes in Hong Kong, the strikes and riots from the mid-80’s, the wildcat beginnings of the 1997dock strike and its subversion by the union (Hong Kong Federation of Trade Unions – HKFTU). In September the union called for support for the students by calling a strike on a national holiday, and what few workers joined the student protest did so as individuals. From October 20 to 23, under the auspices of Chinese president Xi Jinping, the 205 members of the Central Committee of the Chinese Communist Party held its Plenum dedicated to establishing “a system of the strict rule of law” (Reuters. 30.9.14). Under Xi’s eighteen month reign thousands of “corrupt” party officials have been executed, jailed, sacked or demoted in a widespread purge and settling of internal scores. It could mean a hardening stance, moving away from the weiwen policy of the maintenance of stability that has existed up to now. Of late there has been a crackdown on journalists and dissidents; internet censorship has been intensified and protesters from the countryside in the capital, mostly peasants with grievances, have been beaten up, jailed or deported back to their regions. We also saw the incidents of the direct repression of workers in and around the Yue Yuen strikes earlier in the year and the suggestion is that the situation will become more volatile. This need to confront the “social question” is all the more important for the ruling class in China now that the economy is slowing down and debt and the housing bubble are reaching unsustainable proportions. The coincidence of protest in Hong Kong and what must surely turn out to be rising levels of class struggle on the mainland presents the Chinese bourgeoisie with still more potential problems to solve, with repression and “the strict rule of law” the only possible answer that it has. Based in Hong Kong and its legal circles is the so-called “non-governmental organisation”, the “China Labour Bulletin” which is all for the pursuance of democracy and Free Trade Unions for Chinese workers “through peaceful and legal actions”. The CLB has supported and was probably involved in the promotion of the claims for “universal suffrage” among the students and its general approach could either be useful for the ruling class or it could invite repression. Whatever happens the CLB and its backers remain a danger for the working class with its claims for ‘democratic, free trade unions’. The “Black vs Yellow...” text is clear on the current weaknesses of the student protest and the capitalist nature of the demands for democracy that were imposed upon it. It surmises that the student protest has “few paths forward and many routes to defeat” and its critique of the democratic road to defeat, its analysis of “no future” and the necessity of a real extension to the working class as the only way forward are lessons that apply to all the “Occupy” movements across the globe. We can say the indications are that after the heights of the Indignados movement in Spain, 2011/12, which had clear links with and possibilities for the class struggle, and the profound Occupy movements of Turkey and Brazil in 2012/13, that the movement has been checked first of all and then assimilated entirely into the framework of the bourgeoisie and its ideologies. Beginning in the Middle East and North Africa (Tunisia), the more or less positive nature of this movement was expressed in Greece, Egypt, Turkey, Brazil, the UK, the US, Canada and Spain and now the international dynamic of this movement is at least on the wane. The Hong Occupy movement, as one example, seems to reflect this in that the vocal minorities of the original movement that were openly critical of democracy have been drowned out in the latest protests. Democracy, and its twin brothers nationalism and imperialism, have filled the vacuum left by a movement whose only possibility was to extend to the working class and for the working class in turn to give it a kiss of life. Another indication of the end of this wave is how the word “revolution” has been linked to elements of the “Arab Spring” and the Occupy movement. A revolution is a mighty event involving untold masses of class conscious workers acting on their own self-organised grounds. As positive as some expressions of Occupy were they never came anywhere near to this and, at best, could only be an element towards it. Instead we see these “revolutions”, in many cases supported by various anarchists, as completely bourgeois, nationalist and imperialist. The Ukrainian “revolution” in Kiev is a case in point where the working class was drowned and mobilised for war. Some anarchists still go on about the Syrian “revolution” by which they mean the US-backed gangs of the Free Syrian Army. And even today in the barbaric free-for-all in Syria, some anarchists, through their rose-tinted magnifying glasses, see “the best example of the ‘Arab Spring’ so far in the movement of the democratic society in Syrian Kurdistan”. These adjuncts to imperialist war define the “Democratic autonomy” of nationalist ideology in Syrian Kurdistan as a “revolution”. Such forms of anarchism help obscure the way forward for the proletariat by assimilating imperialist war, nationalism and democracy with “revolution”. But the lessons remain the same for the working class in any protest movement or strike even if it’s only small minorities that have drawn them out: assemblies and meetings open to all; free discussion (contrast this to the personalities and leaders of the Hong Kong democracy movement lecturing passive crowds); extension to other workers and self-organisation. The Occupy movement may be done to death but it was a positive and international moment that was unable to go any further without a more profound proletarian turn.